Stamps Health Services is committed to allowing individuals to exercise their rights under HIPAA and other applicable federal and state laws and will take necessary steps to address individual requests to access, inspect, and/or obtain a copy of their health information in a timely and professional manner. Pursuant to the Health Insurance Portability and Accountability Act of 1996 (HIPAA), individuals have the right to access, inspect, and/or obtain a copy of their protected health information (PHI). All requests for the disclosure of protected health information are handled by the Medical Record Department. Your medical record is kept confidential at all times and is not associated with your academic record. 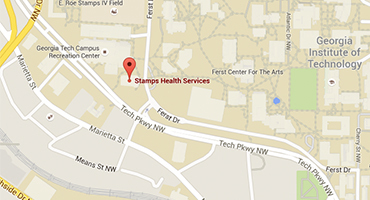 Medical records are retained for a period of 10 years following graduation or your last treatment at Stamps. Students submitting any type of medical records to Stamps while in the European Union are required to complete an additional consent form. Stamps will not accept any medical records from you without an attached signed consent form. In-person: You may make a request in person at the Medical Records desk located on the second floor or Information desk located on the first floor. You need to complete our Release of Information Form and present picture identification. In Writing: Please complete the Release of Information Form with an appropriate signature and mail the form to Health Services - ATTN: Medical Records, 740 Ferst Drive Atlanta, GA 30332-0470. If you are unable to download the form, send a written request including your nine-digit gtID# number, date of birth, address to send your records, years attended, and daytime phone number and appropriate signature to the address above. Please allow up to 30 days for processing. By Fax: Please complete the Release of Information Form with an appropriate signature and cover page and fax the form to Health Services at (404) 894-0626. ATTN: Medical Records. Please allow up to 30 days for processing. Medical Records follows the Health Insurance Portability and Accountability Act of 1996 and applicable state law. The HIPAA Privacy Rule requires Stamps to distribute a notice that provides a clear, user-friendly explanation of individuals rights with respect to their personal health information and the privacy practices of Stamps. Copies of immunizations and medical records are $5.00 per each request.